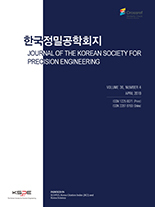 이성욱, 최영수, 정경민,(2019).원자력 시설 안전을 위한 국내 로봇 개발 현황.한국정밀공학회지,36(4),323-329. The importance of safety and emergency preparedness of nuclear power plants (NPPs) has been increasingly emphasized since the Fukushima accident. Recently, the Nuclear Robot and Diagnosis Team at Korea Atomic Energy Research Institute (KAERI) initiated research on an unmanned emergency response robotics system. The objective of the research was to provide a practical means that countermeasure the initial accident stages of NPPs. Considering that the robotic systems that tried to mitigate the damage caused by the Fukushima accident did not work adequately, the robotic system to be developed should be tested in the testbed simulating the accident site of NPPs. In this paper, the recent domestic works on a robotic system for the safety of NPP were introduced.